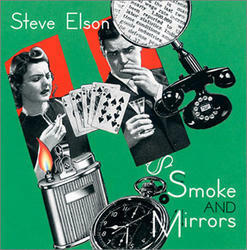 "Smoke and Mirrors" all compositions by Steve Elson published by Lips and Fingers Music, BMI. The Ray Charles band used to test out their material on the road. When they found something special, like what the "Ooh-Ahh" section in What'd I Say could do to a dance floor, they'd record it. Similarly, the music on composer/soloist Steve Elson's Smoke and Mirrors has been distilled from his life as a working musician. Over the last twenty-five years, he's played funk, blues, jazz, rock, pop, r&b, Latin, and klezmer. He's learned lessons you can only get from the bandstand, like the absolute importance of the correct tempo, what makes a horn section tight, and how to lock in with the bass and drums. What's even more important, and less subject to analysis, he's learned how to get down, how far to go out, and how to bring it back home.The excellent musicians Elson has assembled share his breadth of experience. As a result, there's an effortless swing, a relaxed groove, and a sinuous give and take, not only in the solos, but in the supporting parts. While the supple quality of the ensemble performance defies conventional notation, it simply, and profoundly, reflects a common awareness and understanding. What particularly distinguishes the music, however, is Elson's craft as a composer and his attention to detail - themes are rarely stated the same way twice; a lead line will be supported by two, three or four counter melodies; the combinations of instruments and their function within the ensemble will shift from section to section; a canonic cascade will come out of nowhere to support a solo; an apparently free introduction will resurface as a funky bridge. Many of the pieces display a lively wit and a delightful sense of humor - a recapitulation suddenly modulates; an interpolated bar of 5/4 shakes up a regular rhythm; a smokey ballad transforms itself into a superfly groove. Above all, there is an abundance of melodic invention, and some of the tunes are heartbreakingly beautiful.While it's not unusual for "art" composers to be attracted to the vitality of the more functional musics of song, dance and celebration, the results often seem stiff and false. Steve Elson comes at popular music from the inside, where if the band can't cut it, they're out of a job. His pieces feel right, from the langorous propulsion of the tango, to rowdy gutbucket squawk, to the exquisite shadings of the cafe waltz. It may be called Smoke and Mirrors, but this, in all its passionate and soulful conviction, is the real thing.